Moatsatetaw pagoda is situated on the hillock which is 100 feet high and 300 feet far away from the northern part of Myatansaung pagoda. The pagoda was built by king Min Saw Mon as one of the five city-settlement pagodas in AD 1430. The hillock has two levels and the first level was made of stone and it contains a repository for Buddhist scriptures. It is surrounded by the stone wall in four directions. Three stone Buddha images are in the cave. The cave has damaged due to the burglar. Moatsatetaw pagoda is loacted on the topmost level of the hillock. The pagoda was built at the center of the brick substructure called the big terrace which is 100 feet in lenght, 100 feet in breadth and 55 feet in height. The form of the pagoda is that Dadugatba is put over the bell-shaped dome. The pagoda is 50 feet high and 100 feet in circumference. There are four surrounding pagodas at the four corners. 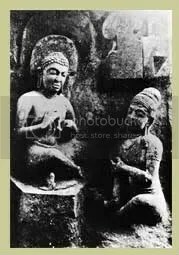 A Buddha foorprint was in the east of the pagoda. Nowadays, the trustee of Chitthaung pagoda moved it to Chitthaung pagoda and put it on the brick seat to be paid reverence by the people. It is necessar for restoration because the pagoda is damaging badly. Sandarama monastery compound built and donated b king Min Saw Mon, is in the northern part of Moatsatetaw pagoda. The stone wall surrounded for the monastery can still be seen. Sandarama monastery is one of the thirty six great monasteries of the ancient Mraukoo. The pagoda was restored by the department of archaeology.